What’s on offer here is new age wisdom for your old soul. Using personal development change techniques gleaned from Neuro-linquistic Programming (NLP), Life-Coaching, Hypnotherapy, EFT, and reams of other personal development sources— I help you find new ways of coping with whatever life is throwing across your path. Getting your life to work. Getting unstuck and motoring again. Helping you get back-on-track with your goals. Appointment and payment arranged via email. Contact Margaret by email. Certain issues lend themselves well to Hypnotherapy. Please let me know if this appeals to you or you feel it might help you. We can work together on issues like letting go of negative emotions, getting in touch with your creativity, and pushing you out of your limiting beliefs. Hypnotherapy is only available in San Miguel and not available online. Appointment and payment arranged via email. Email Margaret here. How do Life-Coaching, Hypnotherapy, EFT and NLP sessions work? Easy. You arrange an appointment and payment method with me via email at margaretnashcoach@gmail.com. If you are in San Miguel de Allende and it’s a personal one-to-one session (not online, that is) you can pay in cash at the session. If it’s an online session, then you are kindly asked to PayPal before the session. San Miguel sessions are 1 hour long. Online sessions 40 minutes. You do not have to do anything beforehand, or bring anything to the session. Just show up and tell me your story. That’s all you have to do. It’s that easy. We talk, I mostly listen, and we discuss what would be the best plan for you to move on with your life. At the end you will leave with an index card with points to remember and/or act on. You can make another appointment at the end of the session. Sessions don’t cost an arm and a leg. I like you to come back so I’m very reasonable. I’d rather have you more often at less cost to you, than one very expensive session. It’s more fun and valuable for you. Especially you. But I enjoy it too. Now I’m not saying the magic, the transformation, the aha moments, the rebirth of your excitement about life, the new goals and stuff you want to manifest, the new sense of purpose, your re-ignited mojo are going to take place EVERY time….but hey, often enough! Both Sarah Grace Powers and I, certified Life-Coaches, run our company LifeCoaching SanMiguel here in Mexico and together provide regular workshops on various topics of interest and relevance. We have been running workshops on Thriving Through Transition, Manifesting Made Simple, and Find Your Perfect Person. 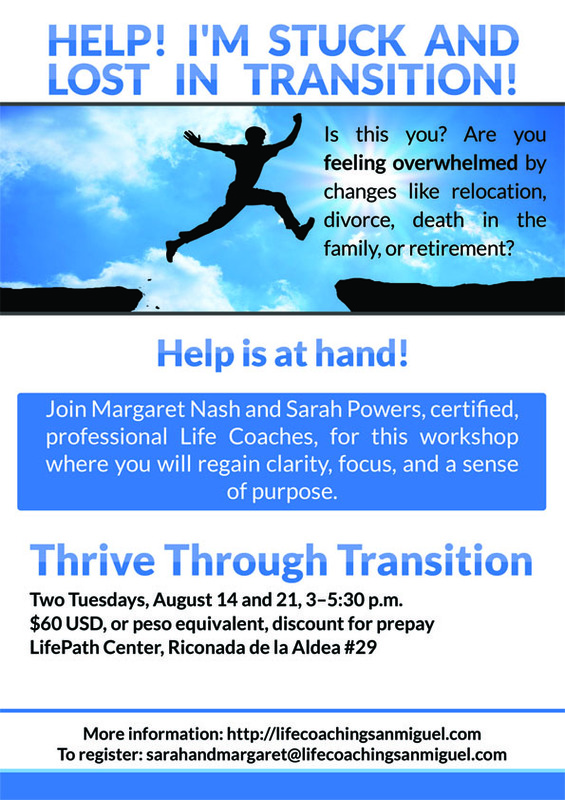 Our next workshop in San Miguel will be in two parts—two 2 hour workshops, each one week apart, on August 14 and 21, 3-5:30pm and held at Lifepath. Find out more HERE. AND, contact me to reserve your spot here.